Today I’m posting a recipe that is not my own. This is Jamie’s Stuffed Shrimp Shells. Who is Jamie? He is somebody who is very dear to my heart, I will tell you more of him at a later date, but today we are talking about his pasta. Jamie doesn’t cook…ever! Except to make the occasional boiled egg and toast, so how does he manage to come up with such an amazingly flavorful dish? I’ve asked myself this question time and time again. I don’t know how he did it, but I’m happy that he did. 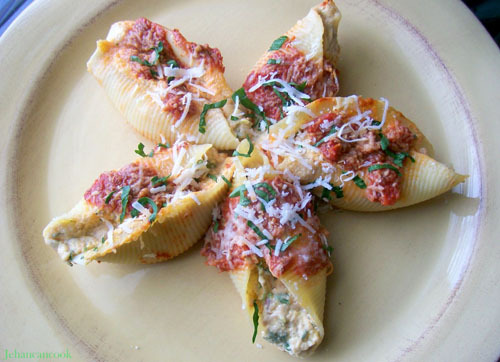 Instead of the boring stuffed shells, your taste buds will be pleaseantly surprised by the delicate and perfect balance of the flavors of the shrimp, cheese and tons of herbs. Jamie can cook! Enjoy. Preheat oven to 350 degrees. Mix Shrimp, salt, black pepper, red pepper flakes, garlic, thyme, oregano and parsley. Set aside. Heat 2 tablespoon of olive oil on medium fire, add chopped onion and peppers, cook until tender. Remove from pan and add shrimp. Cook for 2 minutes, add white wine and cook for additional 1 minute. Remove from heat. Coarsely chop 1/2 of shrimp, set aside. In a blender or food processor, add jar of alfredo sauce, 1 egg, ricotta cheese onion and peppers and remainder of shrimp. Blend until combined but not smooth. Pour into a bowl and add chopped shrimp. In a 13 x 9 pan add spaghetti sauce to cover the bottom. Place about 2 tablespoon of shrimp mixture in cooked pasta shells. Repeat until you’ve used up all the shrimp filling. 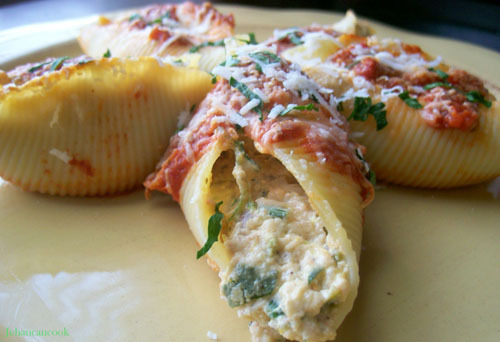 Drizzled about 1 tbsp of pasta sauce over the filled pasta shells, do not cover completely. Top with fresh grated parmesan cheese and bake in 350 degree oven for 40 mins. 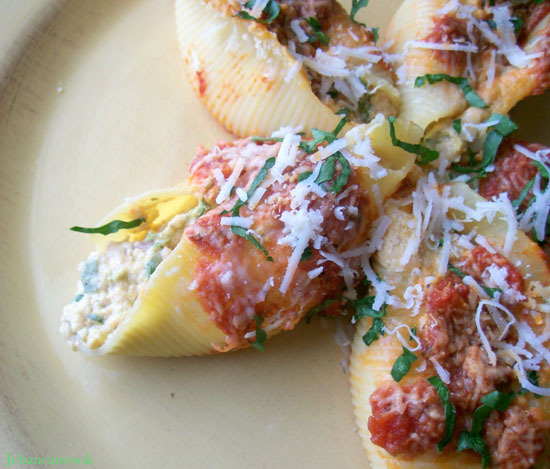 Serve with more fresh grated parmesan cheese and chopped parsley. Thanks for the suggestion, I love spinach!